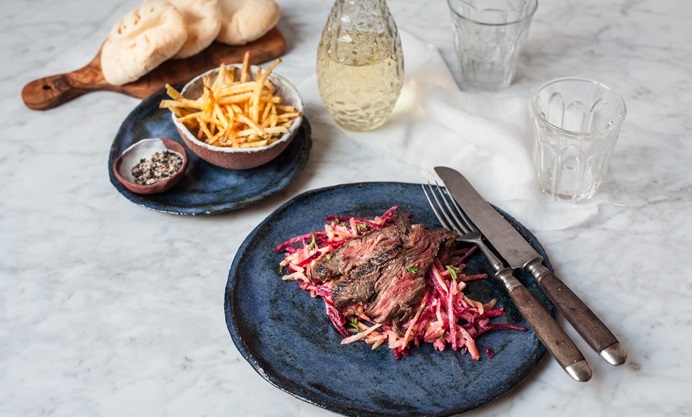 Regula shares her beautiful marinated skirt steak recipe, serving this underused cut as a steak dish with winter coleslaw and deliciously crispy matchstick fries. 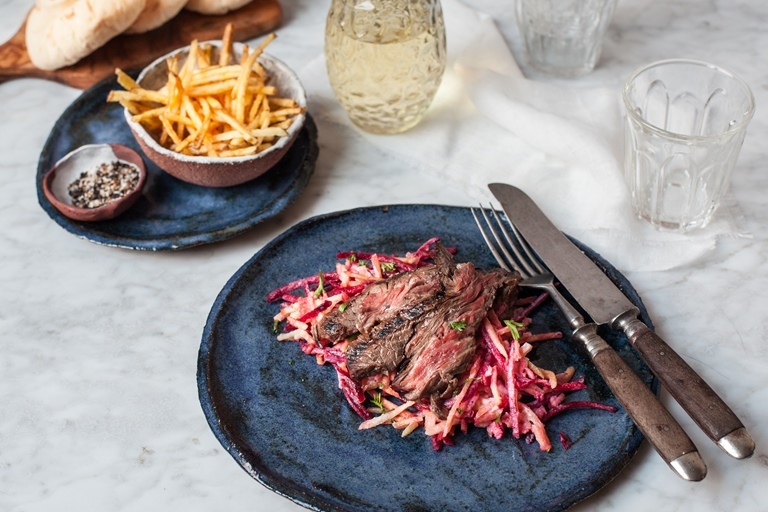 The colours of the beef with the vibrant root salad make the dish as visually appealing as it is tasty. I must admit I do enjoy a good piece of beef from time to time. I tend to hunt down the best quality and then price really isn’t an issue for me. I'd rather eat less meat, but spend a little more on a great product. And even so, you can find cheaper cuts, which are just as tasty as a steak, but many people don’t buy them as they are unsure on how to prepare them. 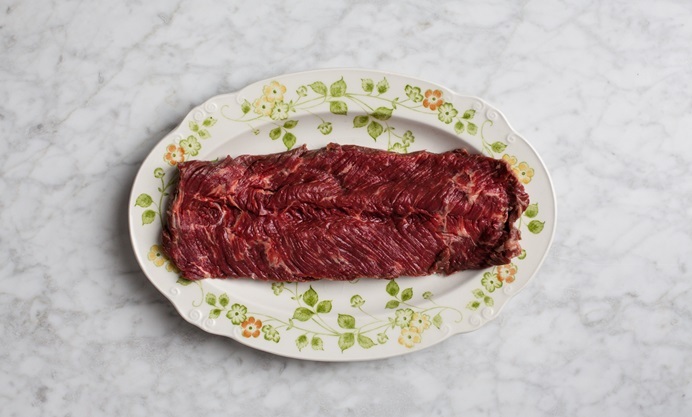 Skirt steak is a cut of beef which is often overlooked, it is long and flat and can be found in the plate which is situated after the brisket and before the flank. It is the ideal cut for stir-fries, and for making fajitas when it is pan-seared or grilled very quickly to prevent the meat from going tough. Slowly cooked it is the preferred cut to use in Cornish pasties. Today I am going to quickly pan-sear the skirt, so I am marinating it and pounding it gently before cooking. Pounding the meat so it becomes flatter tenderises the meat by breaking down the connective tissue. The meat is then served with a roots salad with yoghurt dressing and matchstick fries. 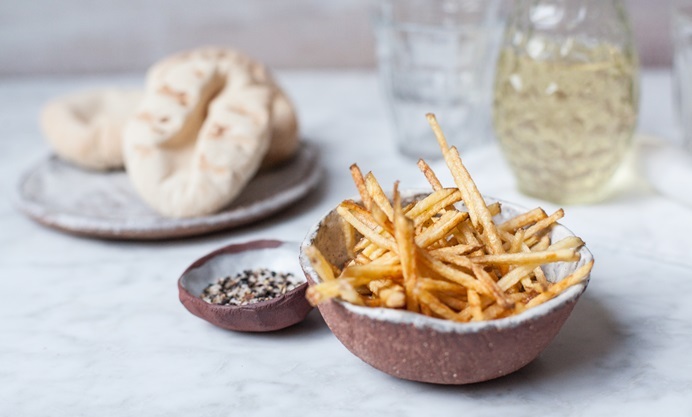 It is nice to have these delicate little fries with this as the meat is quite delicate as well, yet full of flavour. The meat will have a beautiful red wine colour on the inside, and the colours with the root salad will be very pretty. Maybe you have some homemade mayo as well? Then use it!